It is with deep regret that I report the passing of Derek Watkins, the great British trumpet player, following a lengthy illness bravely borne. Derek was born into a brass band family and taught to play the cornet at the age of four by his father and played with the brass band his father conducted, Spring Gardens Brass Band in Reading, of which his grandfather was also conductor and a founder member. He also played with his father’s dance band until he turned professional at the age of 17. Derek Watkins played for many worldwide artists including Johnny Dankworth, Maynard Ferguson, Benny Goodman, Ted Heath, Frank Sinatra and the James Last Orchestra. He also appeared with The Beatles, Elton John, Robbie Williams, Eric Clapton, the London Symphony and Royal Philharmonic Orchestras – and that is just a few from the UK. The list from the USA is equally impressive. Derek played on the soundtrack on every James Bond movie from Dr No to Quantum of Solace and was for fifty years the hottest property around when it came to trumpet playing whether it was on the stand live with the band, playing with the backing orchestra, on the film track or for the CD. 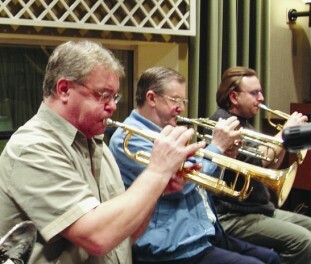 Derek was leader of the lead trumpet. On a personal note, Derek was a people’’s person – no side, no ego, a fun loving musician who couldn’’t get enough of life, who loved his family. Whenever I saw Derek, whether visiting the BBC Maida Vale studios in London to listen to him play Lead Trumpet with the BBC Big Band, or at a gig, he would always have a broad smile on his face and be only too ready to tell you a story. Derek was always hugely generous with his praise and encouragement. Derek was Visiting Professor for trumpet to the Royal Academy of Music, lead trumpet of the BBC Big Band and gave master class clinics at music colleges around the world. He formed an association with Dr Richard Smith, Doctor of Acoustics, at Boosey & Hawkes and together Derek and Richard set up their own manufacturing company, Smith-Watkins Instruments, where they manufactured and supplied both trumpets and cornets. Derek is survived by his wife Wendy and their children, Sean, Ellie and Sarah.